Johanna Bernadina Hut Schroeder was my husband's 3x great-grandmother through his paternal grandfather's line. As mentioned (although misspelled) in her obituary below, she was born in Löningen, Cloppenburg, Niedersachsen, Germany, a fact that actually agrees with the place of origin on her family's passenger list. Her year of birth varies depending upon which source is consulted, but she was born sometime between 1833 and 1834. Johanna Bernadina, who usually went Bernadine or Bernadina, came to America as a young child with parents and her older brother, Theodore, in 1837. The family's surname is spelled 'Huth' on the passenger list, but once in America, they used the name 'Hut' regularly. The family settled in Minster, Auglaize County, Ohio, which was, at that time, a new community of mostly German immigrants. Bernadina's father, Ludwig, passed away in 1839, and her mother, Adelheide, remarried a man named Lucas Clement or Clemens. Bernadina married Franz ('Frank' or 'Fred') Schroeder in 1852. The couple had nine children. Her husband's year of death is incorrect as stated in her obituary; according to Shelby County probate death records, he passed away in 1888. Bernadina's death certificate can be seen below. She passed away 15 January 1921 and the (supposed) age of 86 years. 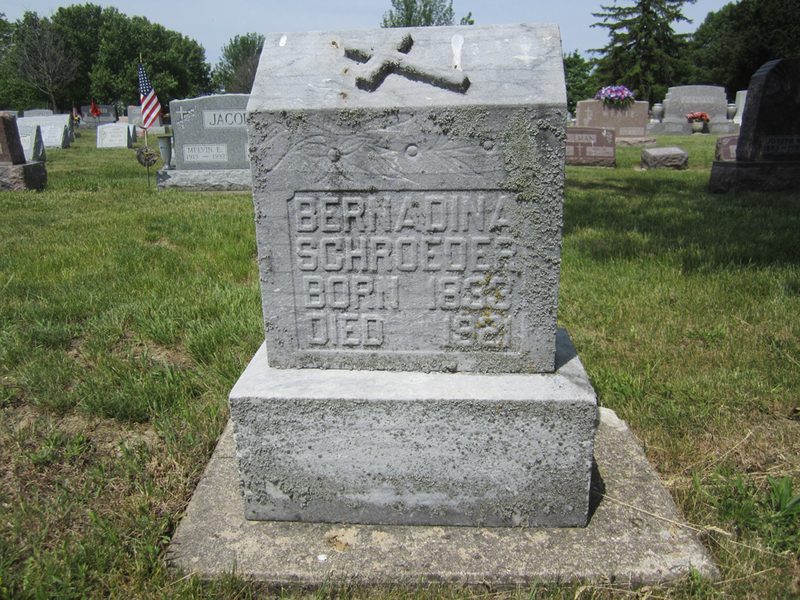 The informant, her son, Joseph Schroeder, incorrectly listed her father's first name as 'John,' but considering that he passed away when Bernadina was still a child, that's an understandable error. Her mother is listed as 'Adline Frozenbusch.' I'm not entirely sure where that surname came from; a family history written by Bernadina's brother, Theodore, states that their mother's maiden name was 'Brant,' and St. Augustine Cemetery records indicate a maiden name of 'Brand' for Adelheide. Bernadina is buried in St. Augustine Cemetery in Minster, Ohio. This past weekend, I attended the Cleveland Italian Ancestry Organization (CIAO) Italian Genealogy Seminar at the Western Reserve Historical Society in Cleveland, Ohio. The all-day seminar featured two nationally-known expert Italian genealogists: Paola Manfredi, AG and Suzanne Russo Adams, AG, both of whom are currently employed with FamilySeach.org. The seminar consisted of four main presentation sessions, with each presenter speaking simultaneously on a different topic, so I had to choose which talks I wanted to attend for each session. I attended Suzanne's first session, entitled 'Beginning Italian Research,' and, although I do not consider myself a beginner, it was a great review of some of the documents and resources I already know about. And, I actually learned things that I didn't know about, especially with regards to the hierarchy of how the records in Italy are made and where they are kept. During the second session, I attended Paola's talk entitled, 'Post Napoleonic Civil Records in the Kingdom of the Two Sicilies.' Her previous presentation was about Napoleonic Civil Records, and she did give a little review of how the recording of civil records differed between the two periods. (Quick note: Both presenters did a great job of explaining the history behind the record-keeping, which was both interesting and helpful.) Paola showed us a lot of examples of actual birth, marriage, and death records so that we could get a feel for how they are arranged, which really helps in picking out the important information. Before this seminar, I was pretty intimidated by records written in Italian. However, I've learned that once you can recognize certain repetitive words and phrases, deciphering the information within the records becomes much easier. Here is the link to FamilySearch.org's educational page on Italian civil records. For the fourth and final session, I went back to listen to Suzanne present about online Italian research resources. She gave us a list of fifty websites that could potential help us with our Italian ancestor research. She highlighted a few of her favorites, including the Portale Antenanti, which contains over 19 million images from state archives all over Italy. Suzanne really emphasized trying to learn about your ancestor's hometown and the region's history, even before you delve into the search for individual records. She told us to try to Google location names in Italian, because doing so will likely yield more results. Currently, there are 30(!) cameras all over Italy, digitizing records that will soon be made available on FamilySearch.org (for LDS members) AND on the Portale Antenanti (for everyone). So, Suzanne told us, if your ancestors are nowhere to be found online as of yet, they probably will be there soon. Exciting news, for sure! Overall, it was a great seminar. I learned a lot, and had an enjoyable time, too! We were served a yummy, yummy lunch and there was even a raffle of some great Italian- and genealogy-related books, food, and gift certificates. We were given awesome, comprehensive syllabus materials and a neat bag in which to carry everything. The price ($45) was very reasonable, and I hope the organization sponsors something like this again in the future. 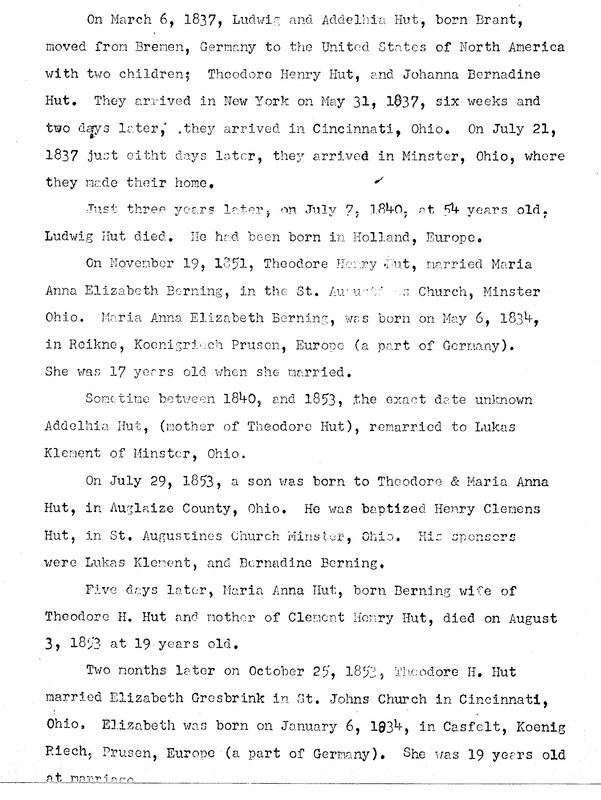 On my recent trip to the Family History Library, I looked up a few birth, marriage, and death records for the Drees Family. Frances Drees Grilliot was my husband's great-grandmother on his Dad's side of the family. Her grandfather, Johann Michael Drees, was born in 1812 in Garrel, Cloppenburg, Niedersachsen, Germany, and immigrated to America in 1833. Using their online catalog, I discovered that the Family History Library does have Catholic Kirchenbuch records for Cloppenburg going back into the 1600s, so I was excited to look through them. 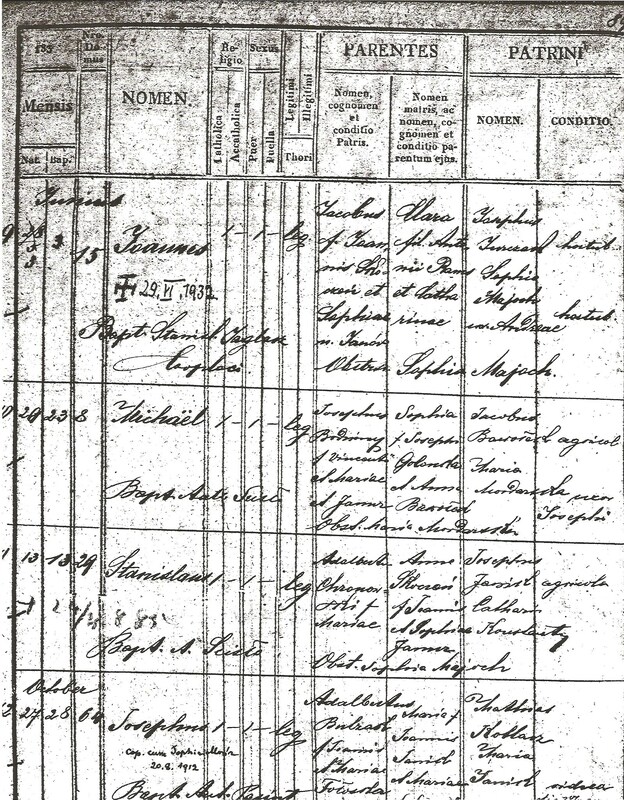 Here is Johann Michael Drees' baptism record below. His father's name is also Johann Michael, which I already knew, because the biography I mentioned above referred to him as 'Jr.' He was baptized 19 May 1812 (second record from the bottom). His mother's name was Maria Catherine Högemann. Johann Michael died 18 Feb 1878 and is buried in St. Augustine's Cemetery in Minster. Interestingly, his gravestone (below) states that he was born 19 Jun instead of 19 May. Now, I am pretty certain that that baptism record says '19 May.' April is clearly right before May, but then if you look at the top of the next page, it says 'July.' So, either there weren't any baptisms in June, there was some mistake by the priest or scribe who entered the records, or Johann Michael (or his descendants) was (were) just mistaken about his birth month. Gravestone Photo Source: FindaGrave.com; photographed by A. Chronicler. Pierre François was the son of Joseph Burtcher and Anne Claire Jardot. Marie Celestine was the daughter of Georges Voisinet and Marie Rose Jardot. Both fathers were farmers. Six months (yep!) after the wedding, the couple welcomed their first child into the world. Marie Rose Julie Burtcher was born 13 Nov 1846 in Évette. She was the couple's only child that was not born in America. They came to America shortly after she was born. For reference, the village of Évette is located near the larger city of Belfort, which is located in northeast France in the Territoire de Belfort. In America, Pierre François went by the name of 'Francis' or 'Frank' and Marie-Celestine went by just 'Celeste' or 'Celestine.' On this census form, their surname looks more like 'Baltaser' than Burtcher, but because of the family members' first names and ages, I have confirmed that this is the correct family. 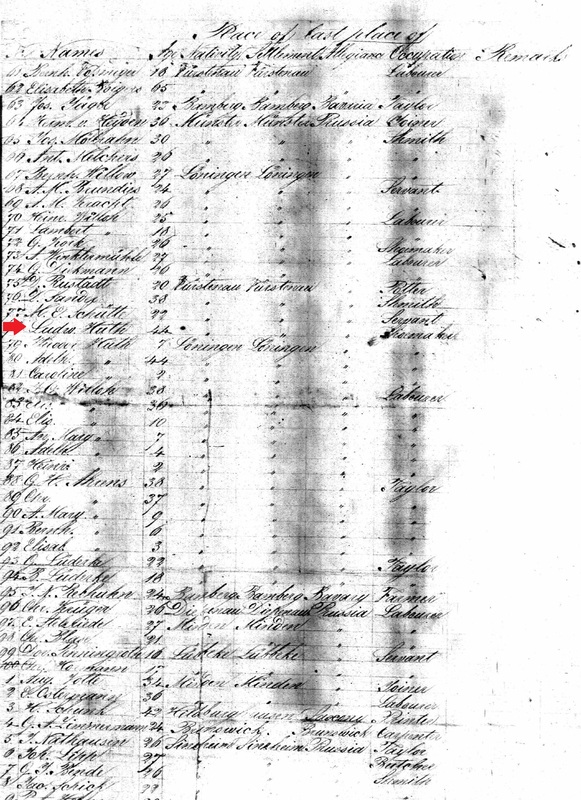 (In fact, most of the French family names in this particular 1850 enumeration district are grossly misspelled - there must have been a great language barrier in this part of the county at this time, when most of the French immigrants were relatively new arrivals.) 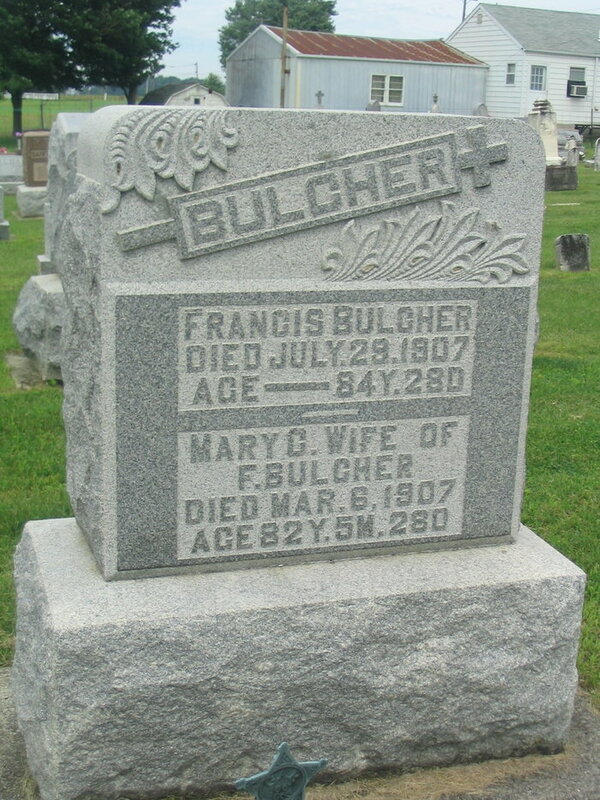 The Burtcher family eventually changes their surname to 'Bulcher', and that is the name found on Pierre François' and Marie-Celestine's gravestone. 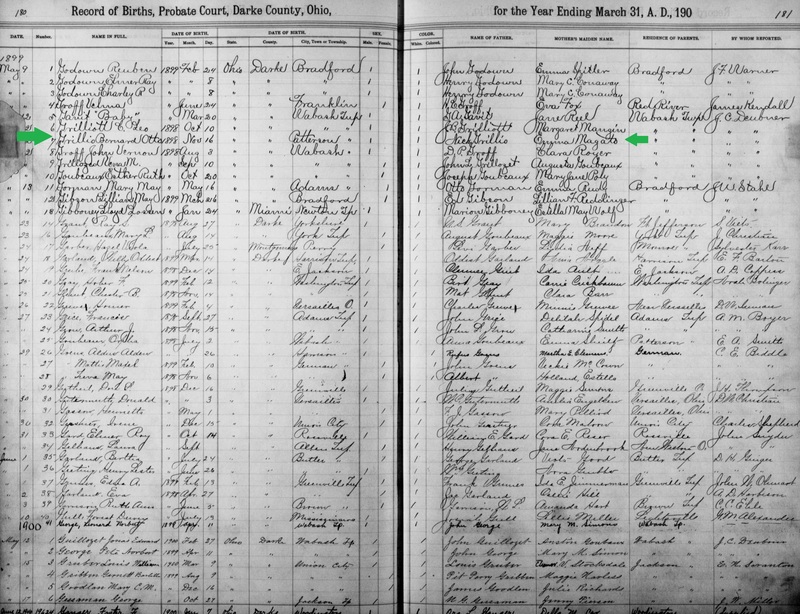 According to his Marie Rose Julie's birth record, Francis Burtcher (or Bultechert as it is spelling in her birth record) was a farmer by trade in France, and he continued to farm in Ohio, as well. Although difficult to read, the 1850 Loramie Township Agriculture Census shows that Francis owns 50 acres of land, only 12 of which are 'improved.' He has one horse, two milk cows, and two oxen. Interestingly, he had 21 pigs, which was more than even some of the larger farms in the area had. In the previous year, the farm produced 24 bushels of wheat, 18 bushels of oats, and as seen on page 2, 35 bushels of potatoes and 75 pounds of butter. At the time of this census, Francis and Celestine had two daughters, Marie Rose Julie (who went by Rose or Rosa), and Josephine Lucine (who usually went by Lucy). Sometime between 1854 and 1860, the Bulcher family moved into the larger French Catholic community in neaby Darke County, Ohio. In that time frame, they also added five children to their family. They had a total of eleven children, with the youngest being born in 1867. The record lists the name of the bride and groom, as well as the names of their parents, including their mothers' maiden names. (Can't ask for much more as a genealogist!) The groom, Joseph Bodziony, age 31, was the son of Vincent Bodziony and Marianna Janor. The bride, Sophia Golonka, age 18, was the daughter of Joseph Golonka and Anna Bawotek. 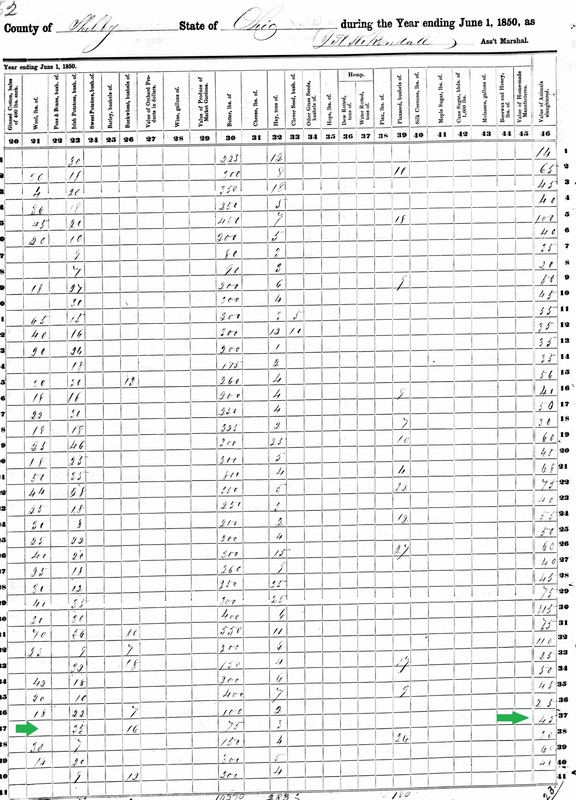 In the last column, the record states that the male witnesses were Joannes (Jan in Polish or John in English) Mordarski and Mattheus (Matthew) Iwanski. As you can see, there is Polish writing underneath the names. Notes like these were not present in every marriage record on the microfilm, so I naturally wondered what it meant. I posted the image in the 'Polish Genealogy' group on Facebook, and asked if anyone could help me read and translate it. A very kind member did so, and I learned that the statement is basically the father of the bride, Joseph Golonka, consenting to the marriage. I also learned from one of the translators that the age of consent in Galicia in the 1860s was 21 years, so Sophia was too young to formally consent on her own. Below is a map showing the location of Brzezna, in what is now southern Poland. After their wedding, Joseph and Sophia went to live in the nearby town of Swiniarsko, which is where all of their children, including my great-grandfather, Michael, were born. As a quick but related aside, when I first started researching this line of my family a few years ago, the only thing I knew about my great-grandfather was his name, Michael Bodziony. Through naturalization papers and his immigration ship manifest, I was able to trace his birth back to Swiniarsko. Thanks to these highly informative baptism records listing both parents AND grandparents, I've been able to trace this line back a couple more generations. I am VERY thankful for the Family History Library's microfilmed records, and even MORE grateful for some of the indexing they have done on these records. If not for the indexing, I would have had to look through records for all the little towns and villages around Swiniarsko one-by-one; BUT, because they were indexed, I was able to find Joseph Bodziony and Sophia Golonka right away in Brzezna. Thank you, indexers!